Summary: Many of us get the feeling that we were meant for something more. Something special. 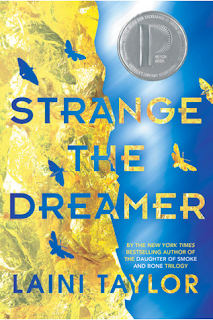 In real life, that doesn't always end up happening, but in this book, Lazlo Strange, who is born a no-name orphan and ends up the errand boy at the prestigious Library of Zosma, finds himself taken along on a journey that only dreams are made of: to figure out the mysteries of a long-lost city called Weep. Summoned by the famous Eril-Fane, christened Godslayer after he rose up against the gods that kept the humans of Weep in slavery, a caravan of warriors, thinkers, tinkerers, and Lazlo head to Weep in order to solve a problem that has long kept Weep isolated across the vast desert. And in the meantime, the long-forgotten children of the humans and the slain gods plan their revenge. Thoughts: This was a slow, slow start. I bought the book when it first came out, because I liked the premise and I like Laini Taylor. (Her Daughter of Smoke and Bone trilogy is one of my FAVORITES.) But this one... it was hard to get into, and I had to start over, like, five times. It's been months since the sequel came out, and it still took me a solid month to get through this book because I wasn't hooked "enough" to prioritize it over other things. Don't get me wrong--it is beautifully written, and in turns poetic, witty, and profound. But there is so, SO much exposition. SO MUCH EXPOSITION. It was a lovely experience to read, but it is hard when there's not much that happens in the first 60% of the book. Reaching that point, though, I couldn't stop. It really started to pick up then (when a certain couple of characters cross paths), and then I was up until 1am finishing the rest of it. There's a lot to take in. It's a very rich world, and the history of all of it is important, and there's a lot of rich imagery and character development, and... yeah, you can understand why there is so much information to get through. Taylor takes her time building the layers of the story, but all of a sudden, you find yourself drawn in and unable to stop thinking about Weep. Just like Lazlo. I get why other people might've given up on this book, but I'm really glad I stuck with it. And I can't wait to get to the sequel.